I've been toying with the mini chopper with springer forks idea for a long time, and decided to act on it. starting with baja mini bike rims, and building up from there. A Home made rigid frame with a Bar Enterprise solo spring seat. 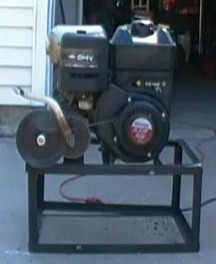 6.5 hp Briggs & Stratton engine with a torque converter and my own home made kick starter system. Then I'm building a springer front end of my own design, Which has been a challenge but it's coming along nicely. ---Triumph handle bars on 5.5" risers, and a Paughco 4.2 gal gas tank. Fenders will be from tractor supply as the tires are 7 inches wide, I'll be using trailer fenders cut to style and fit. 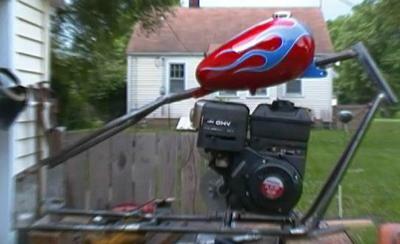 Thanks for checking out my mini chopper with springer forks. Look for the finished product coming soon.